Rittenhouse Archives and www.scifihobby.com are pleased to announce the release of our Stargate SG-1: Season 7 Trading Cards, available February 2005. This all-new series will cover the 22 episodes of the show’s seventh season, and each box is guaranteed to contain 1 hand-signed autograph card and 1 costume or relic card! 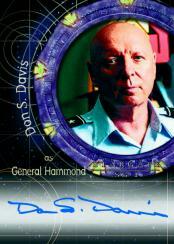 More than a dozen actors will be signing cards for this series including show stars Christopher Judge, Don S. Davis and Teryl Rothery. Stargate SG-1: Season 7 Trading Cards will be our fifth series of Stargate SG-1 trading cards since 2001, and all 4 prior series have been overwhelming sellouts! In addition to autograph cards from show stars Christopher Judge (Teal’c), Don S. Davis (General Hammond) and Teryl Rothery (Dr. Fraiser), this set also features autographs from recurring guest stars Anna-Louise Plowman (Osiris), Tony Amendola (Bra’tac), Robert Picardo (Agent Woolsey), Jessica Steen (Dr. Elizabeth Weir), David Palffy (Anubis), Dom DeLuise (Urgo), David DeLuise (Pete Shanahan) and more! New for this series will be the inclusion of Stargate SG-1 Relic Cards featuring pieces of actual Stargate SG-1 props! We have gathered an impressive collection of props including Jonas' Journal from "Memento", the Alien Diary from "Forsaken", Carter's Surveillance Map from "Paradise Lost", an NID Fax from "Heroes", the Alien Ship Blueprint from "Night Walkers" and others! Also randomly inserted into boxes of the Stargate SG-1: Season 7 Trading Cards will be several exciting bonus sets. There will be two different Behind-the-scenes cards sets written by show stars Christopher Judge and Teryl Rothery. Behind-the-scenes with Christopher Judge will be inserted exclusively in our International boxes, while the Behind-the-scenes with Teryl Rothery will be inserted exclusively into our North American boxes. In The Line of Duty cards will highlight the dangerous missions and self-sacrifices made by the SG-1 team member Teal’c. Fans and collectors will also be able to store their collections in a custom designed collector's album, which will retail for $39.99 and will contain an exclusive costume card of Michael Shanks as Dr. Daniel Jackson and an exclusive promotional card. Rittenhouse Archives, Ltd. is a leading producer of science fiction and fantasy based trading cards and related collectables. Its licenses include Star Trek, James Bond, Xena: Warrior Princess, Stargate SG-1, Stargate Atlantis, Battlestar Galactica, Farscape, Twilight Zone and Conan.